De Sousa replaces a clearly tired Udoka. Azubuike receives a big ovation. I might take Doke out with Delgado resting. Kansas is in the bonus on the next foul. Great start defensively, too. Whistle is quick . . . not sure if that's good for us long term but seems to be working so far. Pirates have missed 10 of first 13 shots and turned it over a lot. And they're down 7 points 8:01 into the game. Delgado made a short shot at the 16:45 mark of the first half to give Seton Hall a 6-5 lead. Scoreless since then. 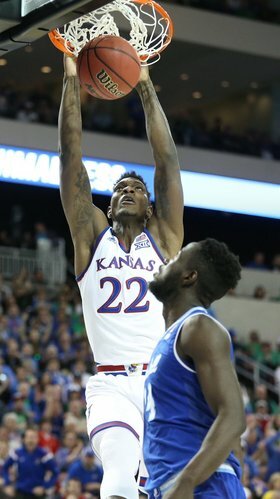 #KUbball is on an 8-0 run and Seton Hall (3-of-13 FGs) hasn't scored in 4:46... KU with a 6-0 advantage when Azubuike was in the game. Silvio's in there for him now. Graham to De Sousa with a lob. De Sousa hyped up and smiling as he runs into the huddle after a Seton Hall timeout. Officially, a 10-0 run for KU. 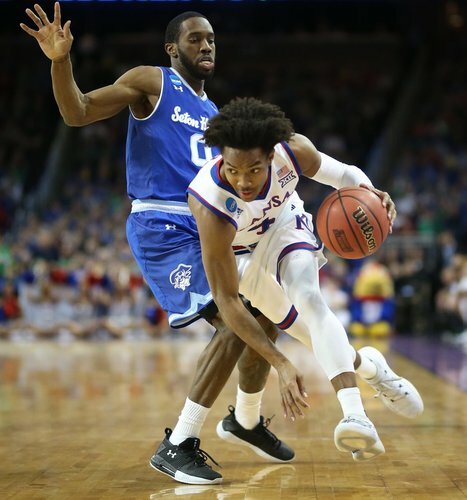 #KUbball out-hustled, scrapped and scrambled Seton Hall on that possession. And it ended with a Graham to De Sousa alley-oop. 15-6, KU. Timeout Seton Hall. 11:34 1st half. Delgado misses an easy layup, makes a much harder shot over De Sousa after an offensive rebound to end Seton Hall's long (very long) scoring drought. That post entry by Graham set De Sousa up for failure. Has to pick his spots better. Two possessions in a row, Desi Rodriguez got Devonte' Graham to switch onto him and sat in the post. Last possession results in a turnover after De Sousa provided a double team. Second foul on Carrington. He's been on fire lately. Angel Delgado has 6 points/7 rebounds. Carrington dove in 30 feet from the hoop to try to draw a charge and picked up his second foul with 10:30 to go in the half. That was an interesting decision. Calling Malik Newman. Calling Malik Newman. Are you there, Malik? KU is shooting 1-5 from 3, 7-16 overall. Seton Hall has to be feeling good, only down 4 and have not played very well. KU has to be better at the free throw line. How can MG be so bad at the liene? Offensive foul on Marcus Garrett. He was a little out of control after bobbling the handoff. Vick didn't stick on Myles Powell and Powell drains a 3. KU up 2. Fans wanted a walk. Powell knocks down the 3 and Seton Hall is on a 7-0 run. Two-point game. Excellent drive by Malik Newman. Even turned down a screen from Udoka.